This week has marked one of the most significant stock market crashes since the collapse of the financial markets in the fall of 2008. However, stocks have overall gained over 200% since then, despite a number of events throughout the years that moved the market significantly. 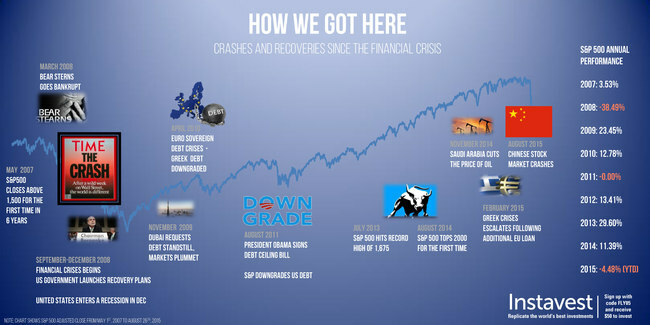 After the S&P 500 crossed the 2,000 point mark in August of 2014, the fall in the price of oil, Greek debt crises, and the devaluation of the Yuan have had major impacts on the markets. Our infographic below shows the activity of the S&P 500 over the years, and the events that got us to this point. The S&P 500 was up nearly 70 points after two days of major losses, closing at 1,940 on August 26th, 2015. Use promo code FLY05 and get $50 to sign up and replicate the world’s best investments on Instavest.